The gallery, Fouladi Projects locates at the entrance of Catro, the south west of San Francisco downtown. Attractive restaurants and colorful shops are coming into the eyes. Wide Market street allows the sunshine enters through the glass wall to the gallery, and it is a comfortable space. “Art is an essential component of living a full life. It provokes us to see things afresh, exalts our senses and connects us to each other and the world in which we live.” The founders of the gallery, Holy Fouladi and Hoe Bryson introduce contemporary fine art. They carefully curate paintings, drawings, photographies, sculptures, and installations, and mediate the roles of art with those. 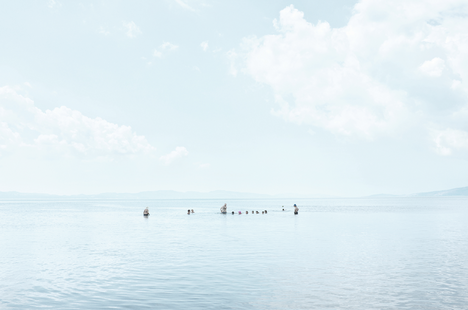 This summer, the gallery shows photo exhibition by 3 women photographers. The works in the show vary in content, but all investigate the human issues of isolation, containment and longing. Inherent in our existence is the need to balance the conundrum between being an individual, physically separate, yet also requiring a vital connection to others to thrive. “Escape” project by Darija Jelincic, who is from Zagreb, Croatia started from searching for moments of tranquility in our daily life. Leaving the stressful city life in Prague, she decided to depart for Lesbos, Greece in the last minutes. Blue sky and vast ocean. Nothing exists between calm straight horizon and her. She finds herself in the huge space. It made her think about how trapped we all are in our constructed realities of urban contents, where rye struggle for success makes us disconnected from nature, and in consequence from ourselves. After leaving the island, Darija started exploring the ways humans search for solutions to the problems that urban contrived spaces create. Darija composes her photographs carefully, usually placing her subjects in the center, capturing their relationship with their surroundings. She examines them through their experience of the space. 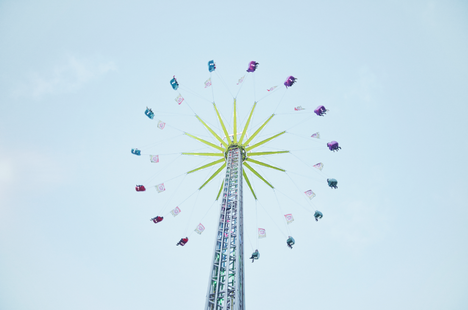 Escape is an exploration about the human experience, about our state of mind during those moments of tranquility, but also physical aspect of it – like in a photograph of a fairground ride. We look up at the sky and see people comfortably sitting on the ride, spinning gently in space, with nothing above them but blue sky. We come to realize that being connected with ourselves means being connected to space. “Escape” may be something which we have lost. Our origins, our connection with nature and with one another. Therefore Escape is, in paradox, a search for the way back home. “Paris” series by Nina Dietzel diptychs juxtapose images which cleverly reveal the universal tension between masculine and the feminine archetypes. Blue green seats in the cold air train and green plant which looks narrowly cramped under the hot weather. White legs and laid arms of mannequins under the yellow curtain and white coin laundry machines and yellow dry machines. They exist different space but have some common points as color, the materials, and structure. Their combination creates mysterious tension. With these hints, people may be able to enter her captured world and connect them. It doesn’t make sense if it’s only onside. You can think of the message here that human life space and the world are physically separated but connected in some points. 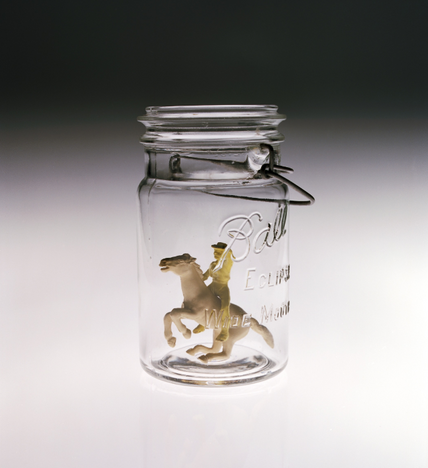 Anne Veraldi‘s photographs are a selection from her Outside-In Series”, which depict both found and remnant artifacts encapsulated within the iconic mason jar, as a way of preserving wistful memories from the past. “These photos are time capsules”, she said. The vignette background presents the atmosphere cosmic-like space. In these glass jars, toys from her childhood remind us of our past memories and the object which she newly created make us feel daydream and fantasy which we had before. 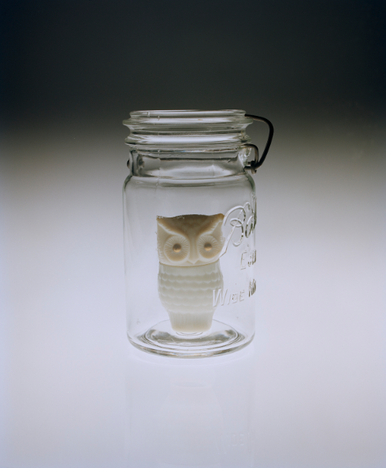 In the photo, tangible memories in the glass jars seem to be left alone in the space, like specimens. Memories and longings are able to be shred and sympathized without being shaped. However once those become tangible, these are physically separated and isolated. If you see the photo of ladder and ships which jump out from the jar, you must be feeling as if a piece of memory tries escaping from there.